No sunny skies, but warm welcome for Skerries travellers ! 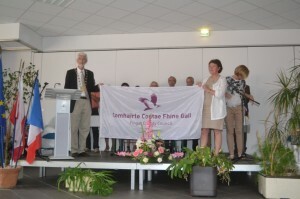 A large group of Skerries locals travelled to our twin area, the Canton of Guichen, from 16th-21st July to celebrate the twentieth anniversary of the signing of the charter of friendship between our two area. . Among those who travelled were several, who had been there at the original ceremonies twenty years ago. Accompanying the group were members of Rinceoil Fingal whose musical talents contributed greatly to the enjoyment of all the events. We also had the great pleasure of having the newly elected Mayor of Fingal, David O’Connor, with us. The theme chosen for the celebrations was ‘Remembering the contribution of those who fought in the Second World War, who laid the future for the Europe of today’. There was also a group of participants from the Canton’s Polish twin town, Srem . A whole programme of events was organised for us throughout the five day stay. One of the most interesting talks was on the enormous contribution made by Polish soldiers to the defence of Western Europe and the role they played in the war in France. On Friday morning, we visited the War Graves in the cemetery in Rennes and laid wreaths to remember the efforts made by French, Polish and Irish combatants during World War II. Of particular interest for us were the graves of George Fitzpatrick, ( great uncle of the Grundy family in Skerries) and Sergeant Ross, ( (who was related to Harry Reynolds of Balbriggan). We also visited a number of retirement homes where we had the pleasure of meeting several of those who had fought for France and hearing their memories of those difficult times. We were delighted that our musicians came along and entertained the residents with selections of Irish music, which greatly added to the occasion. A further conference was held on the future of Europe and our responsibilities to ensuring freedom and equality across the Union. The twelve young people, six from Skerries and six from Guichen who were involved in the three-week work camp, with the leaders and organisers. 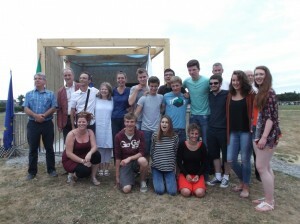 Another highlight was a visit to the work camp in Laillé, where six young local students from Skerries Community College and their six counterparts from the Canton ware engaged in constructing a shelter in the local skate park. This three-week camp was nearing the end of its second week and we were able to see the structure taking shape. Everybody seemed to be having a good time and the Irish group were greatly heartened by hearing Irish voices and the addition of some packs of Tayto and Irish chocolate ! A formal re-signing of our charter of friendship took place in the presence of the eight mayors of the Canton. The twinning committee had also taken the opportunity to invite many of those who were involved with the original ceremonies in 1995. We were delighted to have our very own Lord Mayor with us, as David O’Connor looked resplendent in his chain of office. He took the occasion to present the Fingal flag to the assembly, which was very much appreciated. This was followed by a lively session with Rinceoil again providing the music and Irish, Poles and French united in Fallaí Luimnigh ! Fun and local games were planned for the Sunday. Undeterred by the grey skies, everybody enjoyed the afternoon. 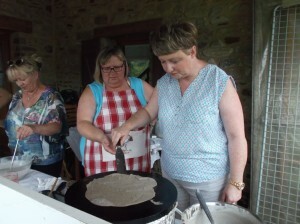 Workshops on weaving, galette making and local cider tasting proved very popular, even if the pétanque and other Breton games were a bit hampered by the damp conditions. A walking tour of local historical sites attracted a number of Skerries walkers, although the falling drizzle did dampen the enjoyment somewhat. A lesson in galette making ! This entry was posted in Town Twinning by SMcK. Bookmark the permalink.